Coming soon to the North Shore area. Do you love to Knit? Crochet? Or just stash fiber? Plan a weekend trip!! I know it's been awhile since I've posted but I'm hoping some of the M.I.T. crowd stops by in Salem to say "Hi" and visit some of the best yarn shops in the area in March. BTW, the picture in the Seed Stitch Fine Yarn store shows a scarf that was crocheted by me, the StitchingNut. I used Spud & Chloe Sweater Yarn ... so nice for the crocheter. But equally as nice for the knitter; which you may already know if you read my Blog. Knitted Plants on display at Seed Stitch Fine Yarn on 21 Front Street, Salem, MA. August 13 - September 30, 2007. Join us on September 14th, 2007 for a reception and lecture by the Artist, Tatyana Yanishevsky at 6pm, $20. 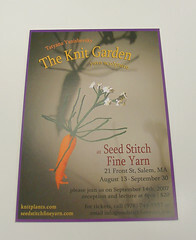 For tickets, call (978) 744-5557 or email info@seedstitchfineyarn.com. I met up with Dee Martin this past Saturday. She's with the Southern New Hampshire Services, Inc. as their Volunteer Services Director. Dee and I go back about 15 years to the NH Lung Association. We worked together for a few years before I came down to M.I.T. 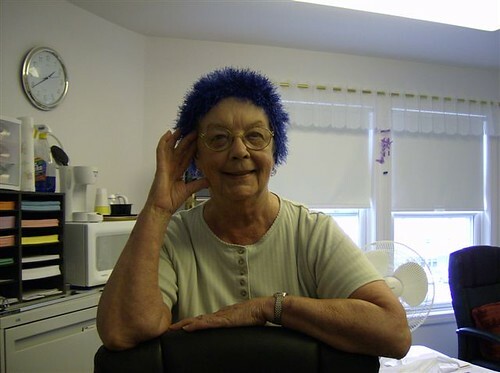 We were also crochet buddies and good friends, so I couldn't ignore an appeal for help. 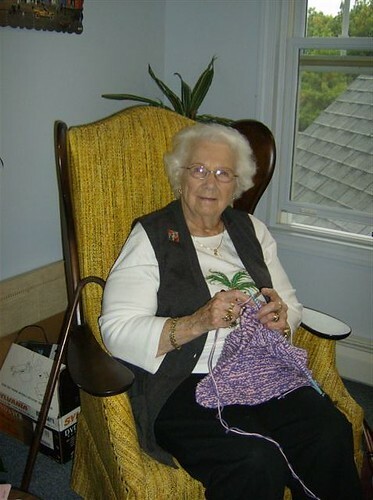 Especially to help Senior volunteer knitters. Fortunately, the MIT SnB community, as well as Victoria at Seed Stitch Fine Yarn in Salem, MA couldn't resist either. I handed over a car trunk load of yarn and pattern books to Dee this Saturday in Portsmouth. Thanks everyone for donating! RSVP will put it all to good use. And remember; they knit & crochet for charity all year long and will appreciate your donations. 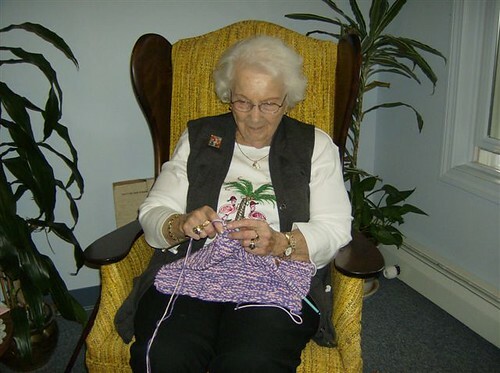 In 2006, 84 RSVP (Retired and Senior Volunteer Program) volunteers knitted over 3,000 goods such as hats, mittens, scarves, chemo hats, lap blankets and much more to be delivered to inner city schools, hospitals, nursing homes and the American Cancer Society. The total cash value was over $28,000, but the impact it made on the lives who needed help to stay warm was priceless. Volunteers warm the hearts, hands and feet of many children and frail elders in the community. 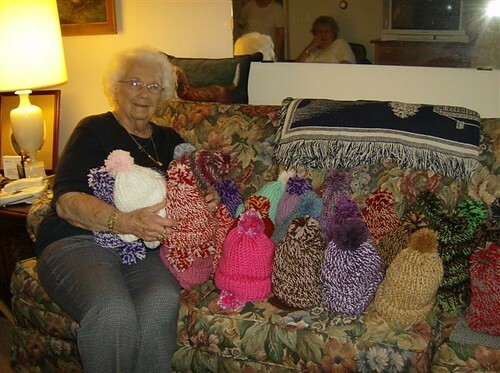 They are making a difference by knitting year round to keep up with the constant demand come the winter months. 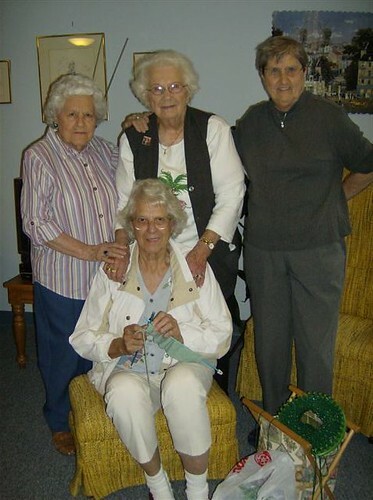 Can you help these seniors change the world one stitch at a time? 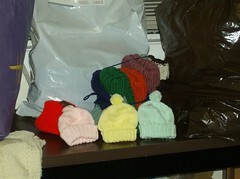 They need skeins of yarn of all colors to keep the volunteer needles going. To donate yarn, please email dmartin (at) snhs (dot) org or call 1-800-322-1073 x 6022. I just got a note from a friend in New Hampshire that works for the Southern New Hampshire Services and they need donations of yarn. 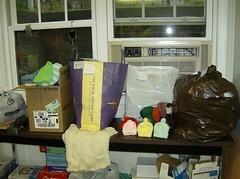 Would you like to clean out some of the unwanted, don't know what you would make with, or have no time for Yarn? If you like to donate knitted or crocheted items to worthy causes, but haven't the time to do the work ... help the Seniors do it for you! Donate yarn! BTW, they like Acrylic the best due to easy & multiple washings. Who knew a skein of yarn could change the world? We need skeins of yarn of all colors to keep these volunteer needles going. To donate yarn, please email dmartin (at) snhs (dot) org or call 1-800-322-1073 x 6022. If you write or call ... just tell her that Rhonda the Stitchingnut sent you! I plan to get together with Dee in April if anyone at M.I.T. would like to send some yarn up with me I'll be happy to carry it along. I have some of my own to bring anyway. She also said that she could arrange to have it picked up. 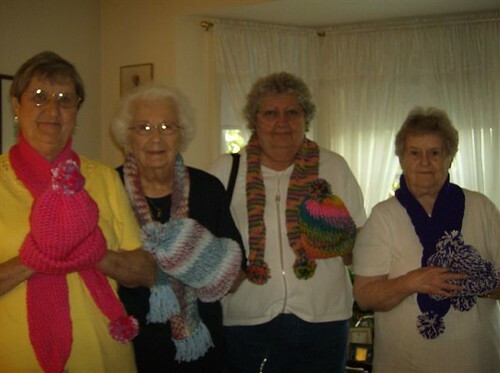 The ladies knit and crochet for charities all year, so donate as often as you can. Thanks for you help.